" The women pulled their children out of the path as he passed. No one would jostle the Executioner as he walked towards the village square. Though his muscles were kept in shape and the envy of every man, such family ties were not for him. No wife would wish to wake next to a husband who brought death to men daily. Instead he had respect. The villagers were in awe of the hooded man, and of his grisly weapon. Stained by the acidic blood of many victims, the polished blade gleamed in the dawn sunlight, reflecting the final moments of the unlucky souls who awaited his presence. The Executioner stifled the satisfied smile that pulled at his solemn expression as even strong men ran to cross the street, to avoid so much as an accidental touch as he passed. As always he continued his journey, alone. " I have been a fan of fantasy art for a long time. It is a genre of art that illustrates the magical and the supernatural beings and environments. Wizards, dragons, warriors, fairies and other mythical creatures are common in fantasy art. Often depicted in a colorful way with great attention to detail. 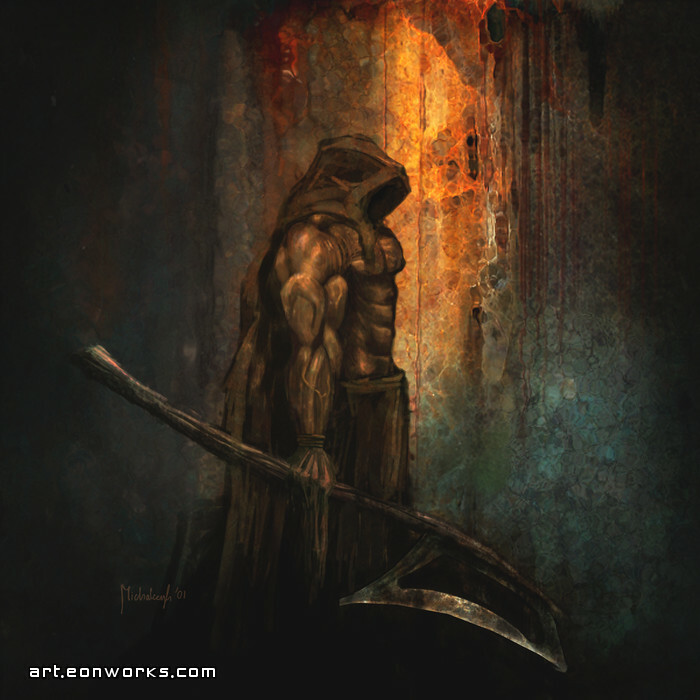 Here I did a somewhat dark style painting depicting a fantasy executioner before putting a condemned person to death. My first attempt at fantasy work after years of working in other genres. I especially like the color induced atmosphere and the unreal executioner figure. How many years have you done this kind of stuff its amazing! The morose, rust- and blood-coloured backdrop reminds me of the survival-horror video game Silent Hill. Very atmospheric. Great work. one can truly feel the essence of death in this art work and feel some pity for the lonely fellow doomed to carry death's curse. how graceful. Lich Torch: Thanks for the feedback. The physique is not supposed to look real, afterall this is fantasy.